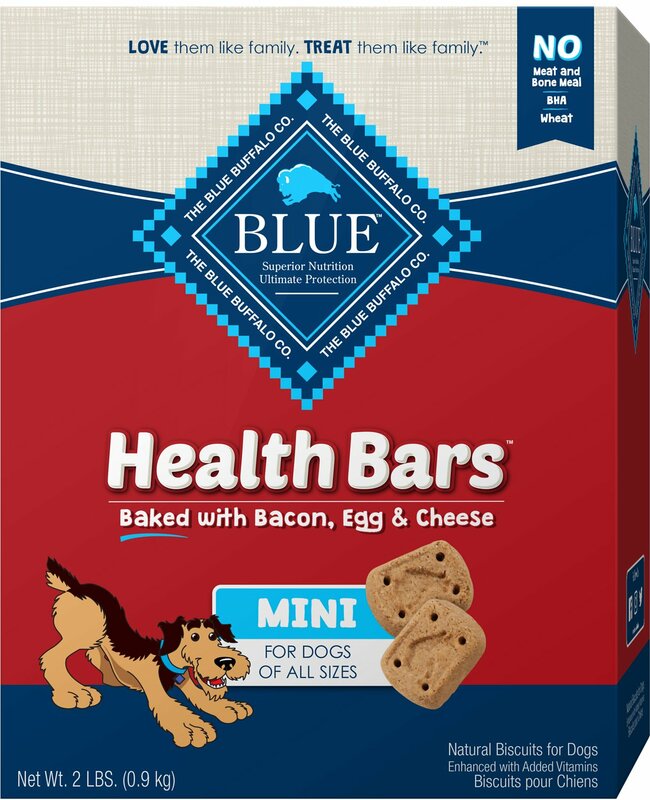 Your miniature dog deserves maximum nutrition, so treat her to Mini Health Bars from Blue Buffalo. 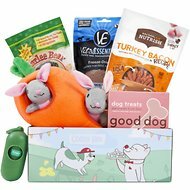 These savory biscuits are made with all the crunch and flavor your dog craves, without the corn, wheat or soy some pet parents like to avoid. While she chomps on the scrumptious taste of bacon, egg and cheese, you'll know she's munching on a snack that rewards her whole body—not just her taste buds. That's because each bite is fortified with omega-3 fatty acids and antioxidants, providing a nutritious boost. Blue Buffalo Health Bars are made with wholesome grains, fruits and veggies, then oven-baked for an irresistible crunch. Without poultry by-products or artificial flavors, colors or preservatives, you can treat your BFF with confidence. These bite-sized biscuits are formulated especially for the small dogs in your life. Oven-baked bars are packed with the flavor of a breakfast favorite and deliver a powerful crunch. Made without chicken or poultry by-product meals—just real, wholesome ingredients. Features fiber-rich grains, but absolutely no corn, wheat or soy. Oatmeal, Oat Flour, Barley, Rye, Chicken Meal, Bacon, Dried Egg Product, Cheese Powder, Flaxseed (source of Omega 3 Fatty Acids), Carrots, Canola Oil, Oat Fiber, Calcium Carbonate, Salt, L-Ascorbyl-2-Polyphosphate (source of Vitamin C), preserved with Mixed Tocopherols, Oil of Rosemary, Vitamin E Supplement. While your furry friend would probably love to have BLUE Mini Health Bars all day long, they are healthy treats intended for intermittent or supplemental feeding only. I had already purchased the Blue Buffalo Health Bars in the regular size but because I have two small dogs I always had to cut them in half. These 'bites' are the perfect size and my dogs love them as do I because of the simple ease of feeding them. My Little ones Love these!! They are the perfect size and coming in the box I noticed less damage from shipping. Thank you once again Chewy you guys are the best!!!! These biscuits are a great size for a lite treat. After walks or when company arrives. My dog loves them. My girl loves these! Great size. Smell super yummy! No complaints. Great price too! Highly recommend these!